Dutton, Edward and Michael A. Woodley of Menie. At Our Wits' End . Exeter, UK: Imprint Academic, 2018. ISBN 978-1-84540-985-2. In the 1960s, from U.S. president Kennedy's proposal of a manned lunar mission to the landing of Apollo 11 on the Moon, 2978 days (almost 100 months) elapsed. In January, 2004, U.S. president Bush announced the “Vision for Space Exploration”, aimed at a human return to the lunar surface by 2020. After a comical series of studies, revisions, cancellations, de-scopings, redesigns, schedule slips, and cost overruns, its successor now plans to launch a lunar flyby mission (not even a lunar orbit like Apollo 8) in June 2022, 224 months later. A lunar landing is planned for no sooner than 2028, almost 300 months after the “vision”, and almost nobody believes that date (the landing craft design has not yet begun, and there is no funding for it in the budget). Wherever you look: junk science, universities corrupted with bogus “studies” departments, politicians peddling discredited nostrums a moment's critical thinking reveals to be folly, an economy built upon an ever-increasing tower of debt that nobody really believes is ever going to be paid off, and the dearth of major, genuine innovations (as opposed to incremental refinement of existing technologies, as has driven the computing, communications, and information technology industries) in every field: science, technology, public policy, and the arts, it often seems like the world is getting dumber. What if it really is? But while I was examining global trends assuming national IQ remains constant, in the present book the authors explore the provocative question of whether the population of today's developed nations is becoming dumber due to the inexorable action of natural selection on whatever genes determine intelligence. The argument is relatively simple, but based upon a number of pillars, each of which is a “hate fact”, although non-controversial among those who study these matters in detail. There is a factor, “general intelligence” or g, which measures the ability to solve a wide variety of mental problems, and this factor, measured by IQ tests, is largely stable across an individual's life. Intelligence, as measured by IQ tests, is, like height, in part heritable. The heritability of IQ is estimated at around 80%, which means that 80% of children's IQ can be estimated from that of their parents, and 20% is due to other factors. The gradually rising IQ of the population resulted in a growing standard of living as knowledge and inventions accumulated due to the efforts of those with greater intelligence over time. In particular, even a relatively small increase in the mean IQ of a population makes an enormous difference in the tiny fraction of people with “genius level” IQ who are responsible for many of the significant breakthroughs in all forms of human intellectual endeavour. If we consider an IQ of 145 as genius level, in a population of a million with a mean IQ of 100, one in 741 people will have an IQ of 145 or above, so there will be around 1350 people with such an IQ. But if the population's mean IQ is 95, just five points lower, only one in 2331 people will have a genius level IQ, and there will be just 429 potential geniuses in the population of a million. In a population of a million with a mean IQ of 90, there will be just 123 potential geniuses. Of the pillars of the argument listed above, items 1 through 3 are noncontroversial except by those who deny the existence of general intelligence entirely or the ability of IQ tests to measure it. The authors present the large body of highly persuasive evidence in favour of those items in a form accessible to the non-specialist. If you reject that evidence, then you needn't consider the rest of the argument. If intelligence was gradually increasing in Europe from the middle ages through the time of the Industrial Revolution, can we find evidence of this in history? Obviously, we don't have IQ tests from that period, but there are other suggestive indications. Intelligent people have lower time preference: they are willing to defer immediate gratification for a reward in the future. The rate of interest on borrowed money is a measure of a society's overall time preference. Data covering the period from 1150 through 1950 found that interest rates had declined over the entire time, from over 10% in the year 1200 to around 5% in the 1800s. This is consistent with an increase in intelligence. A population with growing intelligence should produce more geniuses who make contributions which are recorded in history. In a 2005 study, American physicist Jonathan Huebner compiled a list of 8,583 significant events in the history of science and technology from the Stone Age through 2004. He found that, after adjusting for the total population of the time, the rate of innovation per capita had quadrupled between 1450 and 1870. Independently, Charles Murray's 2003 book Human Accomplishment found that the rate of innovation and the appearance of the figures who created them increased from the Middle Ages through the 1870s. And then an interesting thing happened. It's called the “demographic transition”, and it's been observed in country after country as it develops from a rural, agrarian economy to an urban, industrial society. Pre-industrial societies are characterised by a high birth rate, a high rate of infant and childhood mortality, and a stable or very slowly growing population. Families have many children in the hope of having a few survive to adulthood to care for them in old age and pass on their parents' genes. It is in this phase that the intense selection pressure obtains: the better-off and presumably more intelligent parents will have more children survive to adulthood. Meanwhile, the less intelligent, who in the modern welfare state are often clients on the public dole, who have less impulse control, high time preference, and when they use contraception often do so improperly resulting in unplanned pregnancies, have more children. They start earlier, don't bother with getting married (as the stigma of single motherhood has largely been eliminated), and rely upon the state to feed, house, educate, and eventually imprison their progeny. This sad reality was hilariously mocked in the introduction to the 2006 film Idiocracy . If you've followed the intelligence issue, about now you probably have steam coming out your ears waiting to ask, “But what about the Flynn effect?” IQ tests are usually “normed” to preserve the same mean and standard deviation (100 and 15 in the U.S. and Britain) over the years. James Flynn discovered that, in fact, measured by standardised tests which were not re-normed, measured IQ had rapidly increased in the 20th century in many countries around the world. The increases were sometimes breathtaking: on the standardised Raven's Progressive Matrices test (a nonverbal test considered to have little cultural bias), the scores of British schoolchildren increased by 14 IQ points—almost a full standard deviation—between 1942 and 2008. In the U.S., IQ scores seemed to be rising by around three points per decade, which would imply that people a hundred years ago were two standard deviations more stupid that those today, at the threshold of retardation. The slightest grasp of history (which, sadly many people today lack) will show how absurd such a supposition is. What's going on, then? The authors join James Flynn in concluding that what we're seeing is an increase in the population's proficiency in taking IQ tests, not an actual increase in general intelligence (g). Over time, children are exposed to more and more standardised tests and tasks which require the skills tested by IQ tests and, if practice doesn't make perfect, it makes better, and with more exposure to media of all kinds, skills of memorisation, manipulation of symbols, and spatial perception will increase. These are correlates of g which IQ tests measure, but what we're seeing may be specific skills which do not correlate with g itself. If this be the case, then eventually we should see the overall decline in general intelligence overtake the Flynn effect and result in a downturn in IQ scores. And this is precisely what appears to be happening. And for the West—are we doomed to idiocracy? Well, there may be some possible escapes or technological fixes. We may discover the collection of genes responsible for the hereditary transmission of intelligence and develop interventions to select for them in the population. (Think this crosses the “ick factor”? What parent would look askance at a pill which gave their child an IQ boost of 15 points? What government wouldn't make these pills available to all their citizens purely on the basis of international competitiveness?) We may send some tiny fraction of our population to Mars, space habitats, or other challenging environments where they will be re-subjected to intense selection for intelligence and breed a successor society (doubtless very different from our own) which will start again at the beginning of the eternal cycle. We may have a religious revival (they happen when you least expect them), which puts an end to the cult of pessimism, decline, and death and restores belief in large families and, with it, the selection for intelligence. (Some may look at Joseph Smith as a prototype of this, but so far the impact of his religion has been on the margins outside areas where believers congregate.) Perhaps some of our increasingly sparse population of geniuses will figure out artificial general intelligence and our mind children will slip the surly bonds of biology and its tedious eternal return to stupidity. We might embrace the decline but vow to preserve everything we've learned as a bequest to our successors: stored in multiple locations in ways the next Enlightenment centuries hence can build upon, just as scholars in the Renaissance rediscovered the works of the ancient Greeks and Romans. HotBits server version 3.9 is now in production at Fourmilab. This server is 100% upward compatible with existing HotBits users and API client programs, but has been extensively restructured to improve reliability and fault tolerance. It is able to communicate with multiple HotBits generators and recover from any timeouts or connection problems in obtaining data from them, and requests data from the two identical Fourmilab HotBits generators in a round-robin sequence. Version 3.9 of the HotBits server supports random data generation using the RDSEED instruction implemented in recent Intel microprocessors. This generator can be configured when the HotBits server is built, and allows testing a HotBits generator on a machine which has a suitable Intel processor without the need for the radioactive generator. This option is never used in production HotBits servers, but makes it much easier to test the generator software in development environments. If you want to set up your own HotBits server (which is now more easily done if you have an Intel processor which supports RDSEED), you can download the HotBits version 3.9 software. Here are my picks for the best books of 2018, fiction and nonfiction. These aren't the best books published this year, but rather the best I've read in the last twelve months. The winner in both categories is barely distinguished from the pack, and the runners up are all worthy of reading. Runners up appear in alphabetical order by their author's surname. Each title is linked to my review of the book. In Accelerando (July 2011), a novel assembled from nine previously-published short stories, the author chronicles the arrival of a technological singularity on Earth: the almost-instantaneously emerging super-intellect called the Eschaton which departed the planet toward the stars. Simultaneously, nine-tenths of Earth's population vanished overnight, and those left behind, after a period of chaos, found that with the end of scarcity brought about by “cornucopia machines” produced in the first phase of the singularity, they could dispense with anachronisms such as economic systems and government. After humans achieved faster than light travel, they began to discover that the Eschaton had relocated 90% of Earth's population to habitable worlds around various stars and left them to develop in their own independent directions, guided only by this message from the Eschaton, inscribed on a monument on each world. The wormholes used by the Eschaton to relocate Earth's population in the great Diaspora, a technology which humans had yet to understand, not only permitted instantaneous travel across interstellar distances but also in time: the more distant the planet from Earth, the longer the settlers deposited there have had to develop their own cultures and civilisations before being contacted by faster than light ships. With cornucopia machines to meet their material needs and allow them to bootstrap their technology, those that descended into barbarism or incessant warfare did so mostly due to bad ideas rather than their environment. The problem is, type G stars just don't explode on their own. Somebody did this, quite likely using technologies which risk Big E's “or else” on whoever was responsible (or it concluded was responsible). What's more, Moscow maintained a slower-than-light deterrent fleet with relativistic planet-buster weapons to avenge any attack on their home planet. This fleet, essentially undetectable en route, has launched against New Dresden, a planet with which Moscow had a nonviolent trade dispute. The deterrent fleet can be recalled only by coded messages from two Moscow system ambassadors who survived the attack at their postings in other systems, but can also be sent an irrevocable coercion code, which cancels the recall and causes any further messages to be ignored, by three ambassadors. And somebody seems to be killing off the remaining Moscow ambassadors: if the number falls below two, the attack will arrive at New Dresden in thirty-five years and wipe out the planet and as many of its eight hundred million inhabitants as have not been evacuated. Victoria Strowger, who detests her name and goes by “Wednesday”, has had an invisible friend since childhood, “Herman”, who speaks to her through her implants. As she's grown up, she has come to understand that, in some way, Herman is connected to Big E and, in return for advice and assistance she values highly, occasionally asks her for favours. Wednesday and her family were evacuated from one of Moscow's space stations just before the deadly wavefront from the exploded star arrived, with Wednesday running a harrowing last “errand” for Herman before leaving. Later, in her new home in an asteroid in the Septagon system, she becomes the target of an attack seemingly linked to that mystery mission, and escapes only to find her family wiped out by the attackers. With Herman's help, she flees on an interstellar liner. This just didn't work for me. I never got engaged in the story, didn't find the characters particularly interesting, nor came across any interesting ways in which the singularity came into play (and this is supposed to be the author's “Singularity Series”). There are some intriguing concepts, for example the “causal channel”, in which quantum-entangled particles permit instantaneous communication across spacelike separations as long as the previously-prepared entangled particles have first been delivered to the communicating parties by slower than light travel. This is used in the plot to break faster than light communication where it would be inconvenient for the story line (much as all those circumstances in Star Trek where the transporter doesn't work for one reason or another when you're tempted to say “Why don't they just beam up?”). The apparent villains, the ReMastered, (think Space Nazis who believe in a Tipler-like cult of Omega Point out-Eschaton-ing the Eschaton, with icky brain-sucking technology) were just over the top. Accelerando and Singularity Sky were thought-provoking and great fun. This one doesn't come up to that standard. All of the heavier elements, including the carbon, oxygen, and nitrogen which, along with hydrogen, make up our bodies and all other living things on Earth, were made in stars which fused hydrogen into these heavier elements. Eventually, the massive stars fused lighter elements into iron, which cannot be fused further, and collapsed, resulting in a supernova explosion which spewed these heavy elements into space, where they were incorporated into later generations of stars such as the Sun and eventually found their way into planets and you and me. We are stardust. But we are made of these lighter elements—we are not golden. But, as more detailed investigations into the life and death of stars proceeded, something didn't add up. Yes, you can make all of the elements up to iron in massive stars, and the abundances found in the universe agree pretty well with the models of the life and death of these stars, but the heavier elements such as gold, lead, and uranium just didn't compute: they have a large fraction of neutrons in their nuclei (if they didn't, they'd be radioactive [or more radioactive than they already are] and would have decayed long before we came on the scene to observe them), and the process of a supernova explosion doesn't seem to have any way to create nuclei with so many neutrons. "Then, a miracle happens" worked in the early days of astrophysics, but once people began to really crunch the numbers, it didn't cut it any more. Where could all of those neutrons could have come from, and what could have provided the energy to create these heavy and relatively rare nuclei? Well, if you're looking for lots of neutrons all in the same place at the same time, there's no better place than a neutron star, which is a tiny object (radius around 10 km) with a mass greater than that of the Sun, which is entirely made of them. And if it's energy you're needing, well how about smashing two of them together at a velocity comparable to the speed of light? (Or, more precisely, the endpoint of the in-spiral of two neutron stars in a close orbit as their orbital energy decays due to emission of gravitational radiation.) Something like this, say. This was all theory until 12:41 UTC on 2017-08-17, when gravitational wave detectors triggered on an event which turned out to be, after detailed analysis, the strongest gravitational wave ever detected. Because it was simultaneously observed by detectors in the U.S. in Washington state and Louisiana and in Italy, it was possible to localise the region in the sky from which it originated. At almost the same time, NASA and European Space Agency satellites in orbit detected a weak gamma ray burst. Before the day was out, ground-based astronomers found an anomalous source in the relatively nearby (130 million light years away) galaxy NGC 4993, which was subsequently confirmed by instruments on the ground and in space across a wide swath of the electromagnetic spectrum. This was an historic milestone in multi-messenger astronomy: for the first time an event had been observed both by gravitational and electromagnetic radiation: two entirely different channels by which we perceive the universe. These observations allowed determining the details of the material ejected from the collision. Most of the mass of the two neutron stars went to form a black hole, but a fraction was ejected in a neutron- and energy-rich soup from which stable heavy elements could form. 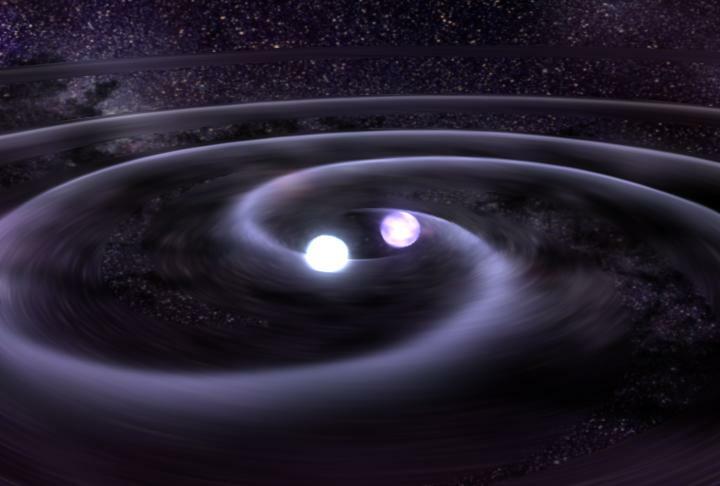 The observations closely agreed with the calculations of theorists who argued that elements heavier than iron that we observe in the universe are mostly formed in collisions of neutron stars. Think about it. Do you have bit of gold on your finger, or around your neck, or hanging from your ears? Where did it come from? Well, probably it was dug up from beneath the Earth, but before that? To make it, first two massive stars had to form in the early universe, live their profligate lives, then explode in cataclysmic supernova explosions. Then the remnants of these explosions, neutron stars, had to find themselves in a death spiral as the inexorable dissipation of gravitational radiation locked them into a deadly embrace. Finally, they collided, releasing enough energy to light up the universe and jiggle our gravitational wave detectors 130 million years after the event. And then they spewed whole planetary masses of gold, silver, platinum, lead, uranium, and heaven knows how many other elements the news of which has yet to come to Harvard into the interstellar void. In another document,I have discussed how relativity explains why gold has that mellow glow. Now we observed where gold ultimately comes from. And once again, you can't explain it without (in this case, general) relativity. In a way, we've got ourselves back to the garden. In the year 1972, there were more than 1900 domestic bombings in the United States. Think about that—that's more than five bombings a day. In an era when the occasional terrorist act by a “lone wolf” nutcase gets round the clock coverage on cable news channels, it's hard to imagine that not so long ago, most of these bombings and other mayhem, committed by “revolutionary” groups such as Weatherman, the Black Liberation Army, FALN, and The Family, often made only local newspapers on page B37, below the fold. So what did this intellectual vanguard of the masses decide to do? Well, obviously, destroy the SDS (their source of funding and pipeline of recruitment), go underground, and start blowing stuff up. This posed a problem, because these middle-class college kids had no idea where to obtain explosives (they didn't know that at the time you could buy as much dynamite as you could afford over the counter in many rural areas with, at most, showing a driver's license), what to do with it, and how to build an underground identity. This led to, not Keystone Kops, but Klueless Kriminal misadventures, culminating in March 1970 when they managed to blow up an entire New York townhouse where a bomb they were preparing to attack a dance at Fort Dix, New Jersey detonated prematurely, leaving three of the Weather collective dead in the rubble. In the aftermath, many Weather hangers-on melted away. Politicians, press, and police weren't sure what to make of this. The politicians, worried about the opinion of their black constituents, shied away from anything which sounded like accusing black militants of targeting police. The press, although they'd never write such a thing or speak it in polite company, didn't think it plausible that street blacks could organise a sustained revolutionary campaign: certainly that required college-educated intellectuals. The police, while threatened by these random attacks, weren't sure there was actually any organised group behind the BLA attacks: they were inclined to believe it was a matter of random cop killers attributing their attacks to the BLA after the fact. Further, the BLA had no visible spokesperson and issued no manifestos other than the brief statements after some attacks. This contributed to the mystery, which largely persists to this day because so many participants were killed and the survivors have never spoken out. As the dour decade of the 1970s progressed, other violent underground groups would appear, tending to follow the model of either Weatherman or the BLA. One of the most visible, it not successful, was the “Symbionese Liberation Army” (SLA), founded by escaped convict and grandiose self-styled revolutionary Daniel DeFreeze. Calling himself “General Field Marshal Cinque”, which he pronounced “sin-kay”, and ending his fevered communications with “DEATH TO THE FASCIST INSECT THAT PREYS UPON THE LIFE OF THE PEOPLE”, this band of murderous bozos struck their first blow for black liberation by assassinating Marcus Foster, the first black superintendent of the Oakland, California school system for his “crimes against the people” of suggesting that police be called into deal with violence in the city's schools and that identification cards be issued to students. Sought by the police for the murder, they struck again by kidnapping heiress, college student, and D-list celebrity Patty Hearst, whose abduction became front page news nationwide. If that wasn't sufficiently bizarre, the abductee eventually issued a statement saying she had chosen to “stay and fight”, adopting the name “Tania”, after the nom de guerre of a Cuban revolutionary and companion of Che Guevara. She was later photographed by a surveillance camera carrying a rifle during a San Francisco bank robbery perpetrated by the SLA. Hearst then went underground and evaded capture until September 1975 after which, when being booked into jail, she gave her occupation as “Urban Guerrilla”. Hearst later claimed she had agreed to join the SLA and participate in its crimes only to protect her own life. She was convicted and sentenced to 35 years in prison, later reduced to 7 years. The sentence was later commuted to 22 months by U.S. President Jimmy Carter and she was released in 1979, and was the recipient of one of Bill Clinton's last day in office pardons in January, 2001. Six members of the SLA, including DeFreeze, died in a house fire during a shootout with the Los Angeles Police Department in May, 1974. Violence committed in the name of independence for Puerto Rico was nothing new. In 1950, two radicals tried to assassinate President Harry Truman, and in 1954, four revolutionaries shot up the U.S. House of Representatives from the visitors' gallery, wounding five congressmen on the floor, none fatally. The Puerto Rican terrorists had the same problem as their Weatherman, BLA, or SLA bomber brethren: they lacked the support of the people. Most of the residents of Puerto Rico were perfectly happy being U.S. citizens, especially as this allowed them to migrate to the mainland to escape the endemic corruption and the poverty it engendered in the island. As the 1960s progressed, the Puerto Rico radicals increasingly identified with Castro's Cuba (which supported them ideologically, if not financially), and promised to make a revolutionary Puerto Rico a beacon of prosperity and liberty like Cuba had become. Other groups, such as the “New World Liberation Front” (NWLF) in northern California and “The Family” in the East continued the chaos. The NWLF, formed originally from remains of the SLA, detonated twice as many bombs as the Weather Underground. The Family carried out a series of robberies, including the deadly Brink's holdup of October 1981, and jailbreaks of imprisoned radicals. In the first half of the 1980s, the radical violence sputtered out. Most of the principals were in prison, dead, or living underground and keeping a low profile. A growing prosperity had replaced the malaise and stagflation of the 1970s and there were abundant jobs for those seeking them. The Vietnam War and draft were receding into history, leaving the campuses with little to protest, and the remaining radicals had mostly turned from violent confrontation to burrowing their way into the culture, media, administrative state, and academia as part of Gramsci's “long march through the institutions”. Other groups may have had different step threes: “Black liberation” for the BLA, “¡Puerto Rico libre!” for FALN, but none of them seemed to make much progress puzzling out step two. Deep thinker Bill Harris of the SLA's best attempt was, when he advocated killing policemen at random, arguing that “If they killed enough, … the police would crack down on the oppressed minorities of the Bay Area, who would then rise up and begin the revolution.”—sure thing. This book is an excellent account of a largely-forgotten era in recent history. In a time when slaver radicals (a few of them the same people who set the bombs in their youth) declaim from the cultural heights of legacy media, academia, and their new strongholds in the technology firms which increasingly mediate our communications and access to information, advocate “active resistance”, “taking to the streets”, or “occupying” this or that, it's a useful reminder of where such action leads, and that it's wise to work out step two before embarking on step one. The urban guerrilla is a man who fights the military dictatorship with arms, using unconventional methods. A political revolutionary, he is a fighter for his country's liberation, a friend of the people and of freedom. The area in which the urban guerrilla acts is in the large Brazilian cities. There are also bandits, commonly known as outlaws, who work in the big cities. Many times assaults by outlaws are taken as actions by urban guerrillas. This would likely have been an obscure and largely forgotten work of a little-known Brazilian renegade had it not been picked up, translated to English, and published in June and July 1970 by the Berkeley Tribe , a California underground newspaper. It became the terrorist bible of groups including Weatherman, the Black Liberation Army, and Symbionese Liberation Army in the United States, the Red Army Faction in Germany, the Irish Republican Army, the Sandanistas in Nicaragua, and the Palestine Liberation Organisation. These groups embarked on crime and terror campaigns right out of Marighella's playbook with no more thought about step two. They are largely forgotten now because their futile acts had no permanent consequences and their existence was an embarrassment to the élites who largely share their pernicious ideology but have chosen to advance it through subversion, not insurrection.